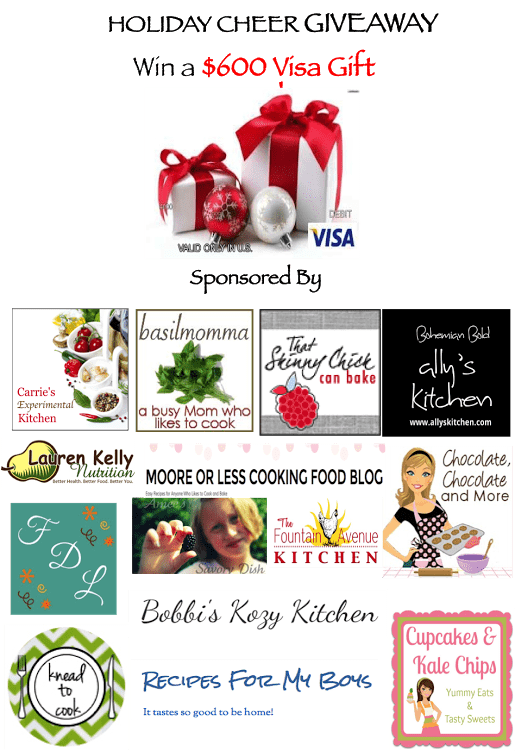 Holiday Cheer $600 Visa Gift Card Giveaway - Chocolate Chocolate and More! That’s right! I’ve got another giveaway for you and this one is perfect to help with all your Holiday shopping! A $600 Visa Gift Card! Thanks to a few of my friends, all you have to do is follow the rafflecopter widget for a chance to win. Open to Us residents only. This is wonderful that you are doing all the giveaways. If I could be lucky enough to win this, I will share with my sister whose husband is out of work and they are raising 2 of their grandchildren. She also takes care of our invalid Mom 24/7. I was hoping to win the mixer for her. Id actually have it help to put it towards my wedding! It would be amazing to be able to buy gifts this year! Money is tight because we got married in October and paid for it ourselves. For the first time in 13 years,I would go see my grandchildren for Christmas. Thank you for the chance! It would definitely be a Merry Christmas!!! put it toward a plane ticket to go see my brother, who I haven’t seen in over 2 years. I would give my grandchildren the best Christmas,their mom has cancer,one grandson is autistic and the other one has a leukemia like blood cell problem,I have my prayers going fast and furious for my little family.I’ve only bee able to see them three times but they are still family and it breaks my heart to see my son go through this. An Ipad and the Speak It! app for my husband. I will buy a new gas stove and I will bake some goodies for my family and friends! I would throw a party for my neighborhood! I like your recipes and this is a nice prize for the holidays. Thank you I look forward to all the yummy holiday recipes. I would treat myself to something nice!! I would definitely donate it to a local food bank. I am so fortunate to have everything I need…food, clothing, shelter and so much more. I would spend a big part of it on Toys for Tots and the Angel Trees in my town and the rest on my 6 nieces and nephews for Christmas. I come here whenever I’m looking for anything new to try. This site is just full of yummies! I would buy some extra nice gifts for my beautiful wife! I’d get my car fixed finally, so my son and I could go somewhere. Also, holiday shopping. Thanks for the chance to win. I would help those in need. I will choose a family with small children who are in need. This would be awesome to win! thanks for the opportunity to won. If I won the gift card, I would buy my kids and my husband gifts that they really need and I would buy myself a kitchen-aid mixer because I bake all the time. I don’t really have any family to buy for so I would buy myself a really good dinner and then use it to donate to the Pet Food Pantry and buy for the SPCA as much as I can from their Amazon wishlist and get them some more blankets and towels since I know they are in need. I would spoil my 3 yr old and pay some bills. This will be the first Christmas where he will start to get the magic. Buy my nieces airline tickets to visit family. We don’t get to see them, my sister passed 5 yrs. ago. What couldn’t I do with the gift card? Christmas shopping! And my daughter is getting married this coming October! So much to buy, not enough cash to do it. LOL!! If I won I would rent a hotel room for my wonderful husband and dog, Chester, to spend New Years Eve in to sleep the night away!!! Would have to take the dog because he is scared of fireworks and loud noises, poor Chester!!! I would use the money to buy myself a proper camera to take pictures for my blog. Whatever was left over would get donated to various charities. Just moved so Christmas budget is tight this year – this would help us get a couple bigger gifts for the kids! I would buy more Christmas presents for my family, and I’d buy myself a new mattress. If I won this prize, I would use it to ensure my family had a wonderful Christmas get together this year. I’d use the money to pay on my school loans…gotta try and get them paid off…. Pay off all my debt and get awesome presents for my family. If I was lucky enough to win this I would use it to buy my kids some clothes and shoes. My dad has been out of a job since August 29th and I only make $710 in disability a month to support me and my two kids. Thanks for doing the giveaway and God Bless. Have a Merry Christmas and a properous New Year. I would get a bunch of stuff for Toys for Tots. I would buy a mattress and other things, or maybe a cheap used car. There’s a lot I need. I would buy gifts for my wonderful family! I would use the money to survive as I am disabled and my husband got laid off a couple months ago. I would love to get my 6 grandchildren a gift for Christmas. I’d give it to my Sister (going through an UNwanted divorce) & her Kids to make Christmas a little happier. I would buy Christmas presents for my kids. My younger brother was recently in potentially life-threatening accident – it’s only by the grace of God that he is still okay. Anyway, his car was totaled and now his family does not have a vehicle that will hold his entire family of 6 so we are trying to scrape together enough money to buy him a used vehicle. This money would go towards that purchase. I would use it to fix the floor on the place we bought. There are quite a few holes that need repair asap! Wow. $600.00 – So many possibilities! But I guess I’d have to say that I would put it towards bills. Is that terribly boring? Use it to replace our 28 yr old freezer that just went out. I’d take a small vacation to the west coast of Florida. Buy my Mom a some decorations for her new house. If I won $600 I would put some toward our broken AC unit fund, and use the rest to buy some Winter clothes. I’d be able to buy my kids the stuff they really want this year! Buy nice gifts for my family! I’d spend it all on my kids to give them a good Christmas, since money hasn’t been coming in. Buy a gift for my parents! It would be wonderful to help pay for Christmas gifts! shop for my three kids!!!! I ‘d have a completely stress free holiday! Start (and finish) Christmas shopping for my kiddos! Whoa, the thought of all that! I’m a single mom (aka cheapskate), it would be amazing to see what I could do with that amount of money! I would use it to help spoil my family for their gifts. This would help TREMENDOUSLY beyond words can speak! When I was growing up, I wasn’t in the kitchen very much. I was a tomboy and liked the outdoors. I am learning to cook by using the recipes I find here and my family loves everything I make now. If I won, I would use the money to help pay off some bills and visit some family we do not get to see often enough. I would pay a portion of my hospital bill… Then I would buy a gift for my son and the hubster.. I would go Christmas shopping for my family, moneys been tight and I haven’t been able to buy anyone anythingyet…..I’ve been down about it, so hopefully I get lucky!!! I would use it to give my family a better Christmas. I am a full time student and there is little money. Who couldn’t use this right now?!? Could use this so badly to shop for my kids and husband! I would buy new clothes for my daughter. holiday shopping plus a belated “giving Tuesday” donation would be on my list! Buy kids christmas and pay a few bills. I love have one for family, kids, grandkids and hubby! I would buy Christmas presents with $600, or some furniture for my new house! I’d treat my husband to something special. Since my husband and I are both without work thanks to a car wreck that left us with back injuries, and a loss of pay for us both me completely and his short term is about 1/3 of what he was making. Christmas is a hope. So I am entering anything that can help us get something for Christmas for our boys and our grandson.. fingers crossed and prayers sent up this would be an amazing blessing for us. I would pay some bills and buy Christmas presents for my little boy. What a dream it would be to win $600 for Christmas! Think of all the chocolate one could buy!! I don’t have anything specific in mind. I would probably ask hubby what should we do with it. I’m sure we would discuss it while we are out to dinner. A dinner out to start. Pay some bills and get my boys some presents! Thanks for the opportunity to win such a great prize. I would put it towards heartworm treatment for a stray dog that we rescued, after his owner no longer wanted him. It would really help. I would help my family. Pay a couple of medical bills and buy all the goodies to make a great prime rib Christmas dinner with all the yummy sides including my mom’s recipe for turnovers! Have a great Christmas and wonderful 2014! I’d use it for christmas. I would donate to Christmas Year Round and buy my dad a new suit!! Buy presents for grand kids!! I’d use it to decorate the house were building. This would be great to help out a co workers family out at Christmas time! Buy myself something special – haven’t done that in years and years – all the Christmas gifts are purchased for the grandkids and everyone. New pair of Merrell shoes, and lots of books to read! I would use it to buy the kids Christmas presents and to pay for the move that we are making to another city for a job. I would make sure that my grandkids had a very nice Christmas! This Christmas will be the first time in 6 years my mom will see my sister and her kids. With a new baby, I have not been able to contribute to the planning of this trip at all. This would be amazing to take some of the stress off my mom’s shoulders. With her health as bad as it is, every little bit of stress relief will make a huge difference. I would use it to help pay our bills and have an extra special christmas for all of my family. Yes that will help a family we know greatly with Christmas. My boys need winter clothes and since I’ve lost 40 lbs so do I! Been a tough year financially for us though my husband works so hard. Winning would help us treat our kids and family to some nice things!!!! Upgrade my kitchen aid mixer I have been wanting to for a couple of months now…. Christmas for the Granddaughters!, would be terrific since I have been out of work for a couple of years now! Put it towards a new refrigerator mine quit. I would help pay off some bills. I could actually buy Christmas presents for my family! I haven’t been able to do that for 3 years since my cancer treatment and disability. I’d be able to get a gift for my husband and not just the kids and I’d be able to pay a few bills without worrying so much about it. I would pay off medical bills then make sure it was a very Merry Christmas! I would support military charities. Oh man, mama could use a keurig and some new “unmentionables!” I’d also get more for my kids for Christmas to ease the burden of The Man, as well as spoil him with a new water resistant/impossible to break watch, AND buy a few things to prepare for the new baby!!! Would def help pay off some bills. Three month old at home. . Hospital bills have begun to roll in. New Christmas decorations for our new home! I would probably put some toward a camera, help my kids, and donate some. That would completely cover Christmas for us, and pay off some bills too. Thanks for the chance to win! Hmmm… I’d have to save it for now. I would pay some bills and give some to my church. Buy something nice for my husband who does everything for his family and country. I would help my son with college expenses. What an awesome prize. My husband just became disabled and winning this would help us tremendously with gifts for the children and grandchildren. Good luck to all. Ha! Finish? I haven’t even started! I would like to be able to enjoy the Christmas spirit this year and winning this surely would help with that. Thanks for such a fab give away. Thank you so much for every post you make for us! Merry Christmas! Would be great to win! Just got laid off! Awesome giveaway. I would use part of the money to get the things my boy needs for basic training. He is leaving at the beginning of January. Christmas which is also his birthday!!! I am pretty much done gift shopping, so I would do some car upkeep that I have been slacking on & make a donation in memory of my niece. buy my kitchen aid mixer!! To be honest, I am not sure what I would do with the $600. At a point in life right now where every last penny I make is budgeted. There is no extra each month, it is all spent just surviving. I have two teenage girls that I would love to have a little extra to spend on since they have been going without for sometime now. That is most likely where the money would go….something special for them…..something that would make this Christmas the best for them…..
My piano could use some TLC. I need a previously owned vehicle. my car’s in the shop – i’d use it to pay for most of that! Would like to donate some to local food bank, we usually try to do something for someone in need each year, this would help us do a little more! I’d donate to the local food bank and pay off a bill. First thing I would do is pay some bills. Then I would get my husband something hockey related for his Christmas gift. I’ll be able to buy my family and my husband family something. I love to give and this would help me give everyone something. Merry Christmas for my family. I would pay some medical bills with it! I will use it for my family’s christmas gifts. Catch up on some bills! Every little bit goes a long way. I am constantly donating to worthy causes and like to volunteer in my free time. Have a happy holiday season for whichever holiday you celebrate! I’d plan a getaway with my husband! I would use it for Christmas. If I am lucky enough to win I would use some to buy gifts to donate. No money for Christmas presents this year, this would sure help! I would do some extra Christmas shopping! Spoil my husband and kiddos beyond belief! I would purchase a ticket to the SEC Championship game for my darling husband – a huge Auburn fan. I would make sure my son has a great christmas! I would get gifts for my friends! Mayb3 something for my dog too. What a weight off my shoulders if I had this gift card to use for Christmas! Thanks for the opportunity! Haven’t even started shopping. Definitely could use the help. The mind boggles. Books – lots of books under the tree. With an extra $600 this year I’d probably put it towards paying off bills. Or save it for a vacation for my husband and I next year. It would definitely be so useful, amazing giveaway! I would a new camera. Mine recently broke. I would use some of it to get a new pair of glasses! Thank you! Merry Christmas!! Holiday shopping, of course! I would pay some bills and buy some things we need for our home. Christmas shopping and Christmas dinner goodies! Thanks for this chance to win! i would be able to buy preasant’s for Christmas this year. I lost my job and it is going to be very hard to buy this year. This would be amazing to win, and would help tremendously! I would buy my daughter a computer if I won a $600 Gift Card. Pay health insurance premiums for a month! Tithe first, then use the rest to do something special with my mom! Thanks for the contest! I would have a party for the children in the community and be sure to include those who I suspected were in need, Favors for the parents also–they so often go without to give extra for their children at holiday time. What a fabulous giveaway! I’d have THE BEST New Year’s celebration, with some fabulous food and drinks (and bunches of friends!). Buy presents for my 4 boys. I am already done shopping for Christmas, so I would use the money to pay off the bills. I’d pay bills and buy nice gifts for the family. Spend it on presents for everyone else! I would send it to my brother and his family in Wyoming so they could come home to Ohio for Christmas! An extra $600.00 would be a miracle right now! I would probably use it for groceries and bills. Thank you! Ig towards Christmas presents and hopefully put some towards a surprise trip to Disney next year for the family. I would buy everyone on our list an extra gift for Christmas. I am in desperate need of a new phone and a visit to see my parents. First I want to say thank you for all the wonderful recipes!! If I won, there’s always bills to take care of and then if I could, I would help someone else, been there myself a few times! Thank you again!! We would use it for Christmas shopping and dinner. Any remainder would go towards bills. That would buy some gifts for my four babies and provide a month’s groceries! Thank you for the chance to win! Finish up Christmas for my girls and pay bills. I am almost done shopping, but I might use it toward a couple of new appliances we could really use! Buy my family new outfits foe Christmas, and some gifts too!! Finish up my Christmas shopping and maybe buy myself the KitchenAid stand mixer that I have been coveting for a long time. Would help my sister get her apartment. Christmas Presents for the family since my husband lost his job! I would pay odf my credit card! Woohoo!! No more worrying. Wow!! $600.00!! That would be an awesome gift!! I would buy gifts for my family of course, but also items for our local “angel tree”.When my 3 daughters were little we always went and each would pick an angel and shop for their gift 🙂 Always tried to instill that giving is the greatest “gift” of all!Now they are all grown with families of thier own and have given me 6 beautiful gifts, my grandchildren!! Merry Christmas & Happy New Year Everyone!! After an unexpected vehicle expense depleted my Christmas fund, I’d definitely put it to work filling Christmas stockings for 15 grandkids! I would use it to surprise my son and nephew with an extra surprise or two under the tree. So generous to give away at Christmas! The triplets each want tablets…oy that is a big request! I would fly out to see my daughter who is in the Navy. Gifts for my girls. Things have been a little tight the last few months. We almost lost our house because the bank wouldn’t take partial payment. Anyways, house is safe but pockets aren’t, LOL! A little extra money is always helpful, especially during the holidays! If I had an extra $600 this holiday season I would buy Christmas gifts and donate some to a pug rescue! I’d like to buy a new TV. A new couch would be nice. If I had an extra $600. I would pay some bills and go see my new grandson who will be 4 mths old Dec, 10th. I got to see him when he was born and have seen pictures of him since but to be able to actually see and hold my grandson no I have not. I am disabled and in a wheelchair. I am working very hard to get out of the wheelchair. My seizures and lung disease along with my RA is the reason for my disablity it keeps me from doing and enjoying alot of the things I love to do. The one thing it has not taken away from me yet is my love for cooking and baking. Some of that money would be used to buy new baking and cooking equipment/utensils. I would use it for my birthday (12/20) vacation to Albuquerque on the 27th of December. I could sure use those $600…………………. I would use it to buy something special for my kids this year! I would pay my bills after buyings a little extra for Christmas. I never do anything for myself. After bills are paid, anything left goes into an untouchanle savings account so I can save little by little. Maybe I could use a massage and some relaxation. But I’d like to show support for my significant other’s son by taking them on a trip so we can all have a little bonding time. I would like to get my niece some clothes of her own that won’t get lost in her transition from daddy’s week to mommy’s week. And I’d like to take my mom and her new husband out and show them that just because he isn’t my biological dad, doesn’t mean there isn’t room enough in our hearts for him. $600 would be great. A new laptop would be great. But given the snow storm that we had this week, a new snow blower for my husband. I would buy some gifts and buy my husband an ipad! I’d use it for an Xbox One. I’d get a few more presents and pay some bills. I would use it to buy Christmas gifts for my friends and family! Take my mom on a mini vacay to California to visit family! We usually go every Christmas, but it’s just not in the budget this year. This would be perfect! THANKS for the chance!! What a great giveaway..thanks SO much.. Thank you for the giveaway! I’d use it to pay bills and help with Christmas gifts. I want to buy a swing set and a tent for my son Jack! I would use it to pay some bills so that we could have a stress free Christmas. I would probably put it towards paying bills from Christmas! Pay bills and make some much needed repairs! I would get new household furnishings. I’d buy some nice gifts for my family! I’d start and finish my Christmas shopping for my family!! Thanks for this opportunity!! I would give to my daughter who is struggling right now this Christmas. She feels so hopeless, and I feel so helpless, to help her. I know a lot of people are in great need this year from reading the comment posts. My husband and I cannot purchase gifts for anyone In our family either. But we are so blessed. Yes, like everyone else, we’ve all experienced birth, deaths, illnesses, financial loses, and we have a son in the military. But I can still say, that God has been with us through all of it. And I want to acknowledge, the reason for the season, Is His son Jesus Christ. May you and your family be blessed this Christmas and in the coming New Year. I would use it for baby needs, I am expecting my little boy tomorrow! I would use the $600 to help pay bills. I’m single with no kids, but have been saving every extra penny and bought myself a house. I have a TON of students loans to pay, working a full time job 8-5 everyday, and a part time job about 25 hours a week. $600 would be a miracle for my student loan payments! I would use the $600 to buy a Vitamix Blender. I’ve wanted one in the worst way but can’t bring myself to spend that kind of money on a blender BUT if I was to win, I would be selfish and spend it on myself and get the Vitamix. I have to say it would really be for my family too as I know I would use it everyday to make yummy smoothies, soup, sauces, pesto, etc. for my family. I’d purchase a new recliner for my living room. Thanks. thanks for all the recipes!!! I would find a family that doesn’t have much this Christmas and go buy some presents the fixings for a Christmas Diner. Then I would take my husband and I out to a nice restaurant for our Anniversary. My husband and myself are currently both not working and this would be a great help with some bills and to pay for Christmas for my son. Thank you for the opportunity to win a $600 Visa gift card, some lucky winner will be blessed with this.